‍‍‍Functional training is all about knowledge, strategy and execution. We combine Bio-Mechanical Science, Motivational Interviewing, Mobility and Metabolic Conditioning in our workouts and thrive to understand your ‍‍‍body as a whole, as an integrated mass of complex joints, tissues, organs and nerves. Once we get to know your movement patterns and how your body operates, we create strategic and custom techniques, and establish goals to help you achieve #theEPIClife. ‍‍‍At‍‍‍‍‍‍ EPI‍‍‍C, a personal training session can be intense and challenging, but it’s also a time for you to slow down. Our trainers are less concerned about how many burpees you can do to failure and more concerned about how your foot hits the floor after you jump up in that burpee. We want to know why your back keeps arching in as you move into the plank position, why you’re holding your breath and why your knees make a cracking sound every time you squat. When your body understands function, when you can feel your body out of alignment, when you know the difference between muscle pain, joint pain, psychological pain, emotional pain and spiritual pain, only then you find what you are looking for. EPIC personal trainers are here to do exactly that. We will find your path, guide you to the outcome you desire, and, once you get on top of that mountain, we help you descend, realign your strategy and prepare you for your next climb (goal). ‍‍‍Why EPIC Fi‍‍‍tness + Lifestyle? ‍‍‍‍‍‍We just approach things from a different perspective. 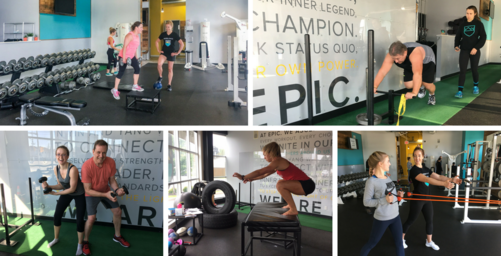 At EPIC our clients experience major positive transformation - not only in the gym - but in their everyday lives. We want to empower you. We want you to feel your body. We want you to get so good at functional movement habits that you not only feel powerful in the gym, but also in the rest of your life. And sometimes we will drive you nuts. We push you beyond what you think you can do. We will push you mentally, emotionally and physically. We give you the promise that your best internal self will thrive. Always! How quickly will I see the results with you? Essentially, everyone's goals are different. Our ultimate goal is to create the body and mind that can stand the test of time through the various chapters of your life such as a crazy life transitions, aging, grief, pregnancy, emotional turmoil, injury, high stress and high bliss moments. It may take months, it make takes years. We are not going to promise you something that is impossible to achieve or something that is simply a fool’s dream. What we will promise you is that if your goals align with ours, if you want results that are sustainable, we will get you there no matter what! Yes, I am interested! What’s next? Are you tired of the hamster wheel, tired of being yelled at by a trainer that doesn’t track any programs or is only good at yelling? Or, are you tired of being intimidated simply by walking into the gym, tired of the traditional ways of doing things? If you are in search of meaning, purpose and a strategy – we invite you to try it the EPIC way. It has the potential to change your life and the potential to help you take back the power of your body, soul and mind. We guarantee it.